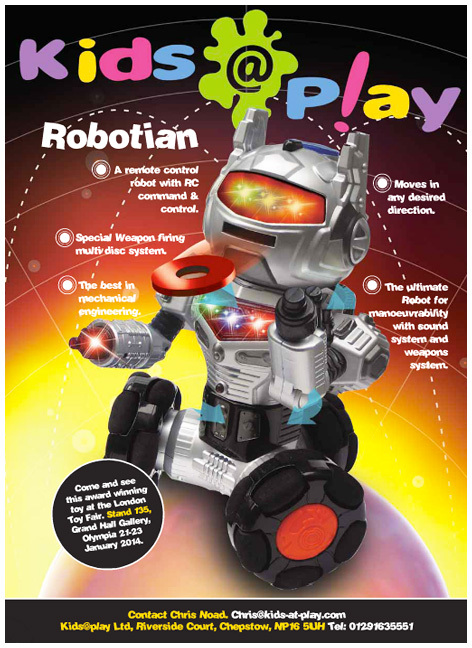 Released by Kids@Play is the incredible Robotian radio controlled robot. This awesome looking toy is packed full of features including the disc firing weapon system located in his mouth. All commands are made from the hand controller which also regulates the speed and multiple sounds system. Cleverly designed with three large wheels for ultimate 360˚ manoeuvrability, Robotian also has a light panel on his chest and another on his face plate. His articulated arms are another great example of a well-engineered product that can stand up to the multiple battles that his kid owners will create for him. Kids@Play also distributes a great selection of battery operated ride-on toys with licences like MG for a mini quad, Star Wars for R2-D2 and an incredible Doctor Who Dalek. Please tell us what you think of Robotian by Kids@Play.